« Sardines–to go with the cucumber salad! 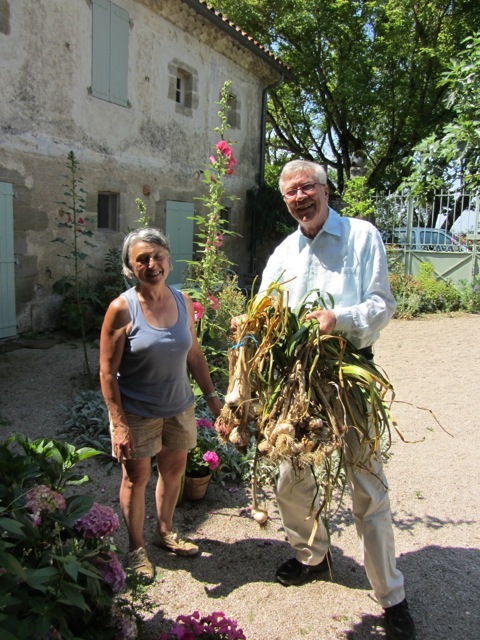 Voila!–sorry to hear that though.A farmer’s/gardener’s life. …nice story, great pictures, Robin! I planted my “special” garlic only last month — in pots, so they can finish in the house. Have fun on the first Friday of August! 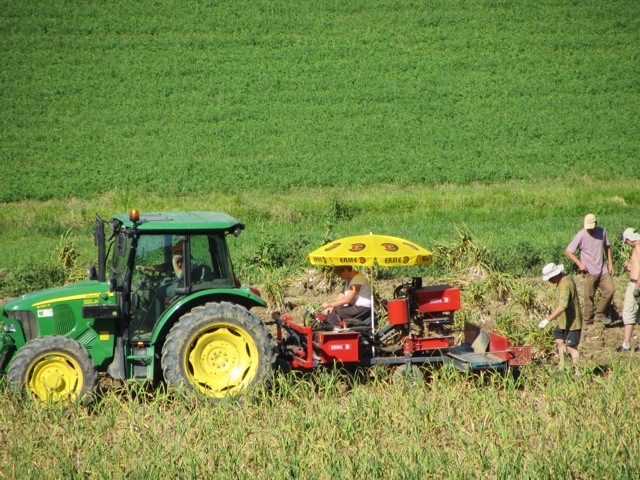 on July 13, 2013 at 3:29 pm | Reply Dianne P.
That was neat, Robin, seeing how they harvest the garlic–thanks for the interesting video. 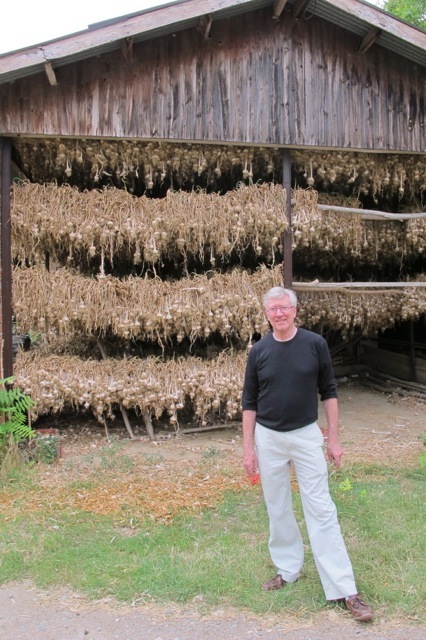 When I saw the barn with four layers drying so close together, I wondered how they kept the air flowing. Then I read on & saw how you pay for it with all the noise!! Makes me think of the new air conditioner we just bought. It’s reminiscent of a plane gathering its willpower right before takeoff….Lovely! 😦 Hope you share pics of the festival–positive thinking! 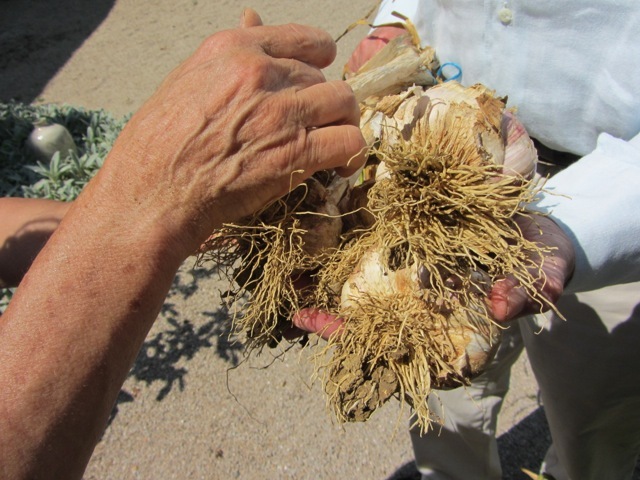 Here in the Bay Area/California, we have a garlic fest in Gilroy, a bit south of San Jose. 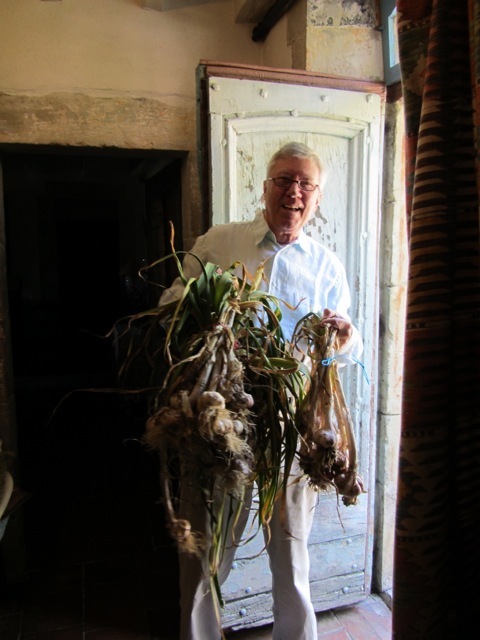 From our garlic to yours, “bon appetit!” Hope all is well there, give my best to Meredith. 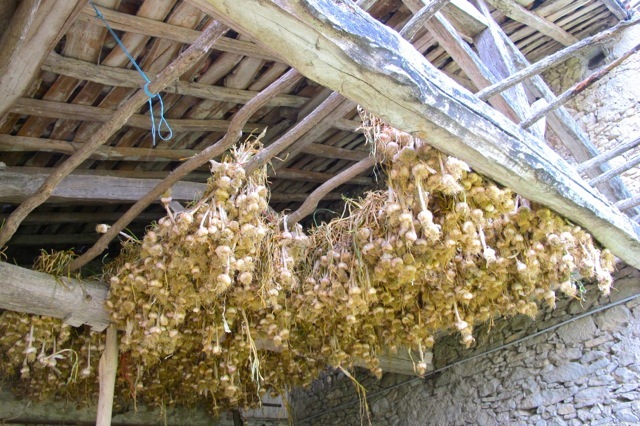 Someone once brought us a kilo of garlic from Gilroy. We didn’t say anything about “coals to Newcastle”! Meredith sends love. do you eat garlic scapes? Seems to be the latest thing now. I live in Canada. If you do, what do I do with them? Got a bunch from a farm and am at a loss, except made lots of pesto. Never used them. Like asparagus? Steven Hill’s comment reminded me, on a road trip In CA many years ago found myself in Gilroy eating garlic flavored ice cream…..something never to be forgotten. looking good as ever Robin! Kind regards from Nuneaton. I’m new to the garlic scape thing. I made pesto with half garlic scapes and half basil leaves, olive oil, bit of lemon juice and zest, toasted pine nuts, parmesan and bit of salt. It is quite good. Tried grilling on the bbq a couple of times and they were hit and miss, but yes, grill them like asparagus. The thinner part of the stem and little bulb at the top are best. I also used them like green onion but they take a little longer to soften up. Froze some in small bits like green onion to pull out when needed and froze more in large pieces for making into pesto later. (I had an over-abundance of them from a harvest box purchased at a local farm). I hope you and Meredith had a good 14 Juillet yesterday in Lautrec, here in Antwerp the weather is good for the moment. 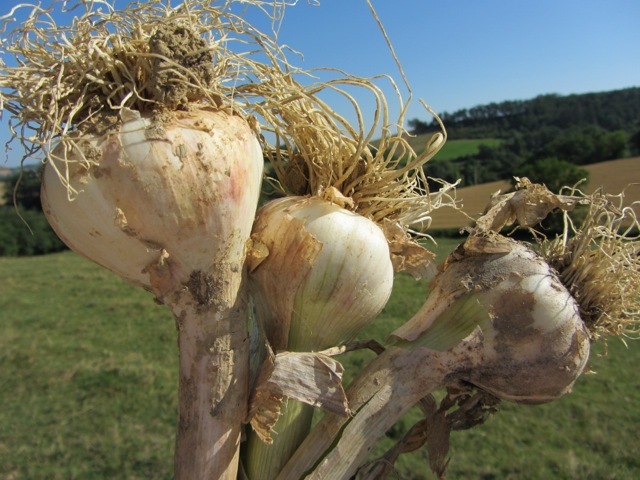 Unfortunately my dear husband cannot eat real garlic (or raw onions); the price he would pay afterwards is horrific, so I must enjoy your garlic festival vicariously. I can use a little garlic powder in our food if I am careful, so I must be content with that.